Tilapia Fish Tacos exploding with flavor from a quick fish marinade and the most flavorful spice rub! 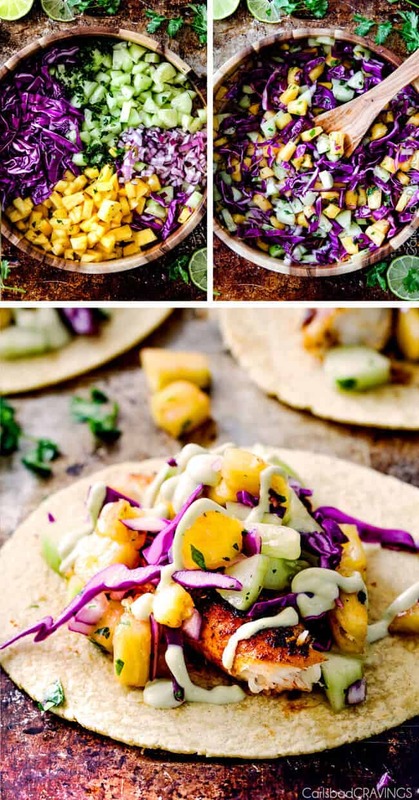 Blackened Tilapia Fish Tacos topped with complementary refreshing sweet and tangy Pineapple Cucumber Slaw and addictive silky Avocado Crema are the BEST light, flavorful and filling Fish Tacos that rival any restaurant! These Tilapia Fish Tacos are easy to prepare, healthy and about to become a new favorite for lunch, dinner, friends and family! Are you guys tired of my taco recipes yet? I sure hope not because I could eat the layers of flavors and textures all day, everyday, especially these Blacked Tilapia Fish Tacos! 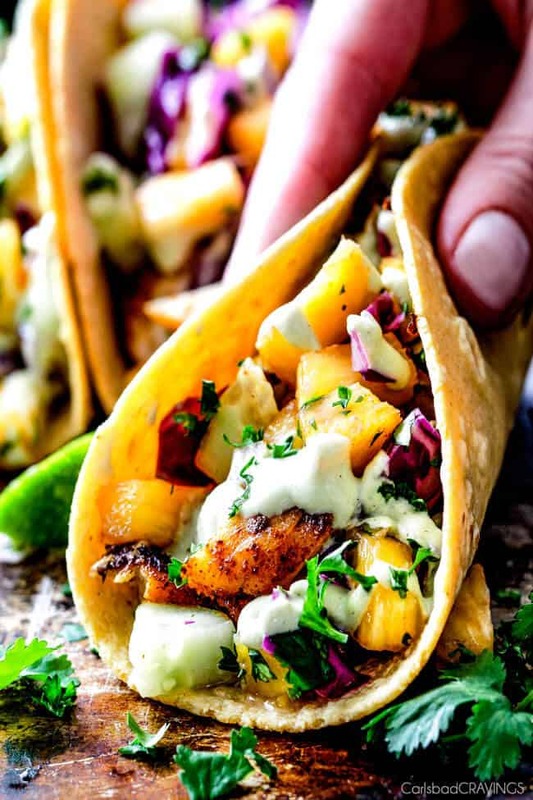 Here in San Diego, we have our fair share of palate pleasing Mexican restaurants and I often find myself ordering the fish tacos whether deep fried Baja Fish Tacos (A MUST TRY) Grilled Fish Tacos or Blackened Fish Tacos as opposed to chicken because I don’t make as much fish at home. But to be completely honest, I think I just spoiled myself from ordering fried fish tacos again because these Tilapiia Fish Tacos are just that good and so much healthier! Both marinating and blackening the tilapia gives these easy fish tacos so much flavor while still tasting light, fresh and satisfyingly delicious. White fleshed, mild, flaky fish fillets are traditionally used in fish tacos such as tilapia, mahi mahi, sapper, halibut or cod. I chose tilapia for these fish tacos because because they are mild, cook quickly and can be purchased at a competitive price year round. You are welcome to substitute your favorite fish for this blackened fish taco recipe. Tilapia is currently the fourth most popular type of fish in the US behind tuna, salmon and Alaskan pollock. Tilapia is the third most popular aquaculture or farm raised seafood product behind shrimp and salmon. Tilapia is nicknamed the “aqua-chicken,” because it can be produced on a mass scale. This allows tilapia to be available year round at affordable prices without sacrifice quality. You have probably eaten more tilapia than you realize! Since 2006, Americans have consumed over 1 pound of tilapia per person each year. Processing and packaging methods are regulated to ensure the tilapia fillets have a mild, uniform flavor. Tilapia is the oldest farm raised fish in the world. It is primarily raised in freshwater systems using cages, ponds, raceways or open waters. Organic production methods for tilapia have been developed by some farmers. How do you marinate fish for fish tacos? I first tried making these Tilapia Fish Tacos without marinating them and just using a spice rub – but I found all the flavor was on the outside and the inside of the fish was still bland. Not okay. Not good enough for you my friends! Instead, to infuse these blackened fish tacos with flavor through and through, I whipped up a simple marinade of olive oil, lime juice, soy sauce and some of the spices from the Spice Rub. Now we’re talking better than restaurant Tilapia Fish Tacos! You marinate your tilapia for 30-60 minutes – NO more or it will get mushy! Although I personally use ancho chili powder a lot, I shy away from sharing it in recipes because I try and use common pantry spices so you don’t have to go buy more for one recipe – but I had to use it in this Blackened Tilapia Fish Taco Rub. I first tried the rub with chipotle powder, cayenne, etc., but it just wasn’t perfect. Ancho chili powder, however, was just right. Ancho chili powder comes from ground dried poblanos and is more mild than cayenne or chipotle powder but still has a deep rich, smoky, mild sweet heat. Perfection. So I promise if you buy ancho chili powder I will start using it more in my recipes so it won’t go to waste 🙂 but even if for just this recipe, it is so worth it. How do you pan fry tilapia for tacos? I like to blacken my Tilapia Fish Tacos. 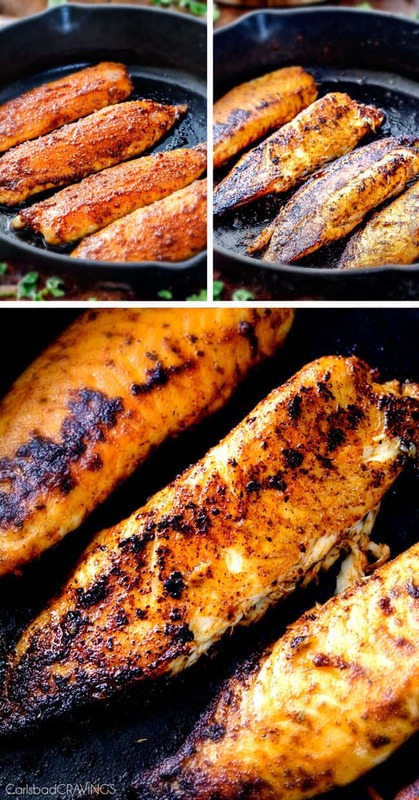 Blackening isn’t just burning – or we all might be expert at blackening by now, but is a cooking method in which fish or chicken is cooked in an extremely hot cast-iron skillet for a few minutes to sear the outside of the fish. The smoking skillet combined with the spice rub gives blackened food a a nice crispy seasoned crust. And the best part is cooking literally takes minutes – which makes these Blackened Tilapia Fish Tacos extra company friendly – do all the prep beforehand and when friends arrive, cook for 6 minutes! After the tilapia marinates, dab off the marinade. Rub tilapia with the spice rub mixed with a little olive oil. Let fish rest for 15 minutes. In a large cast iron skillet, heat 1 tablespoon olive oil over medium high heat. Once very hot, add 1 tablespoon butter. As soon as it melts, add fillets and cook approximately 3 minutes per side, or until nicely blackened. 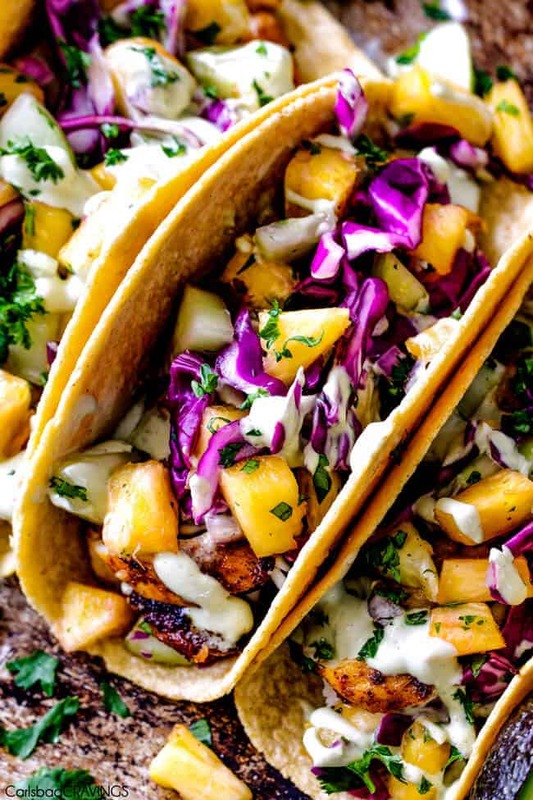 These marinated Blackened Tilapia Fish Tacos would not be complete without the refreshing sweet tang of the crunchy Pineapple Cucumber Slaw against the blackened smoky spice rubbed fish. Pineapple salsas or slaws are one of my favorite additions to tacos from my Chili Lime Chicken Tacos and Tacos Al Pastor to my Teriyaki Chicken Tacos. 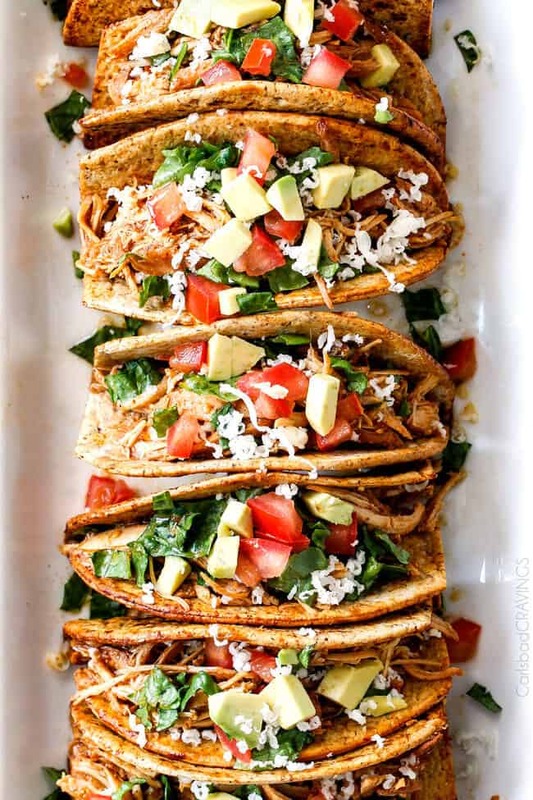 because after all, the best thing about tacos is layering them with flavors and textures so you have mouthfuls of spicy, savory, sweet, tangy, creamy all in one mouthful. 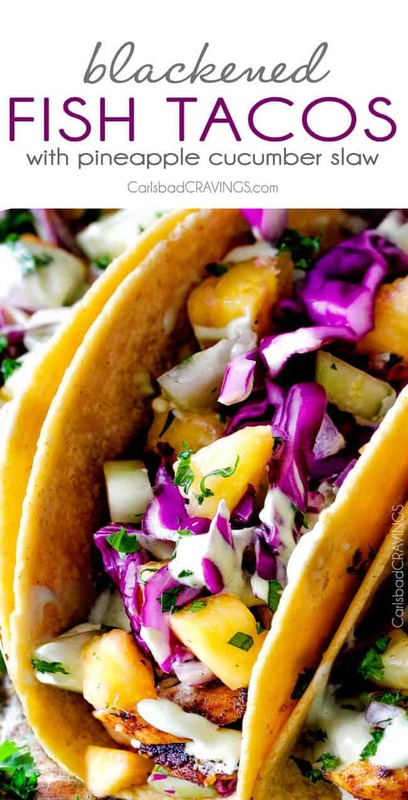 The Pineapple Cucumber Slaw is a quick tossing together of fresh pineapple, red cabbage, cucumber, red onion, cilantro and lime juice – so refreshingly delicious and so ready to be piled on your Tilapia Fish Tacos! Lastly, I had to drizzle with my Avocado Crema that I use all the time. No matter whatever “drizzle” or crema I come up with, this one will always be my favorite ever since I used it in my wildly popularand Cilantro Lime Shrimp Tacos, because everything tastes better with creamy avocado infused with lime, cumin, garlic and cilantro. What to Serve with Fish Tacos? I love my Tilapia Fish Tacos with Mexican Rice or Cilantro Lime Rice, Grilled Corn Salad or Southwest Salad, big pile of chips and either homemade salsa, or salsa verde. 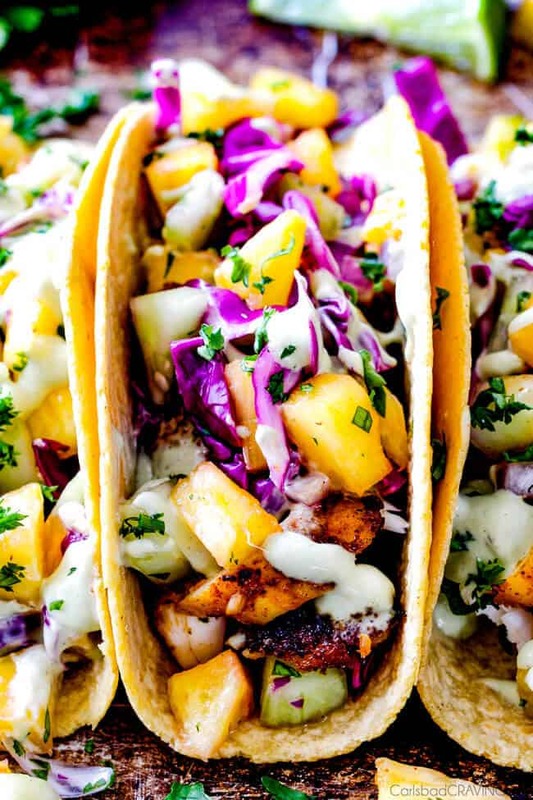 Now stuff your tacos until your content, with the Blackened Tilapia Fish Tacos, Pineapple Cucumber Slaw and a drizzle of Avocado Crema and prepared to be blown away by the symphony of tastes and textures. Followed by Churros. You’re welcome. xo. Want to try these Tilapia Fish Tacos Recipe? 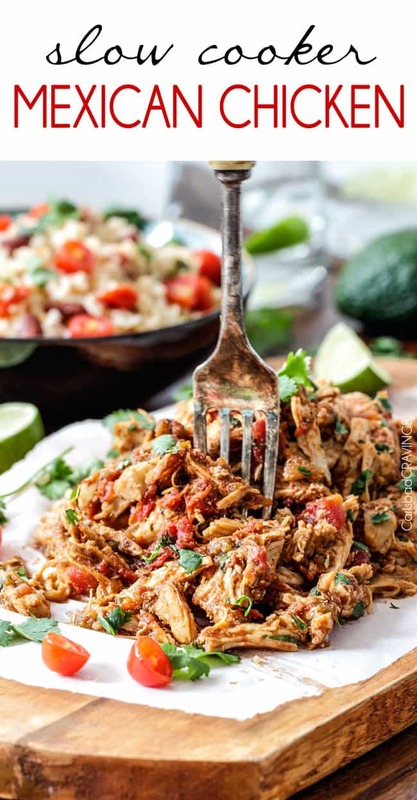 Pin it to your SEAFOOD, or DINNER or MEXICAN Board to SAVE for later! Marinade: Mix together all of the Spice Rub ingredients in a medium bowl. Remove 1 1/2 tablespoons Spice Rub and add this to a large freezer bag along with all of the Marinade ingredients. Whisk together then add fish. Marinate at room temperature for 30 minutes. You will use remaining spices later. Avocado Crema: Meanwhile, make the Avocado Crema by adding all the Crema ingredients to your blender and blending until smooth, scraping sides down as needed. Refrigerate in an airtight container until ready to serve. Pineapple Cucumber Slaw: Add all of the Pineapple Cucumber Slaw ingredients to a large bowl. Toss to combine. Refrigerate until ready to serve. 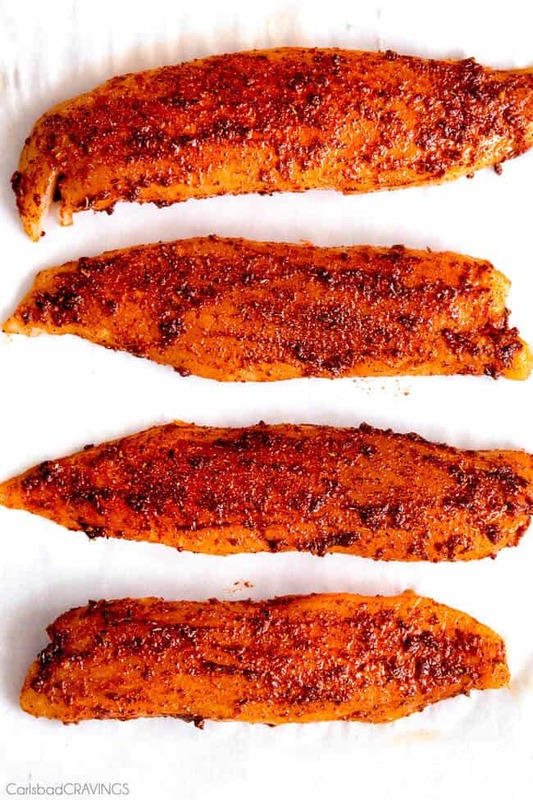 Spice Rub: After 30-60 minutes (no more), remove fish from marinade and pat dry. Mix remaining Spice Rub together with 1 tablespoon olive oil in a small bowl. Rub evenly over fish and let sit for 15 minutes at room temperature. Cook: In a large cast iron skillet, heat 1 tablespoon olive oil over medium high heat. Once very hot, add 1 tablespoon butter. As soon as it melts add fillets and cook approximately 3 minutes per side, or until nicely blackened. Assemble: Remove fish from skillet and break into large pieces. Evenly divide fish among tortillas then top with cheese, Pineapple Cucumber Slaw and Avocado Crema. Garnish with additional lime and hot sauce if desired. Total prep time does not include marinating. What’s the measurements for the spices?